The second of my BFI London Film Festival screenings was as different from the first (Night Moves) as night is to day, for a variety of reasons. 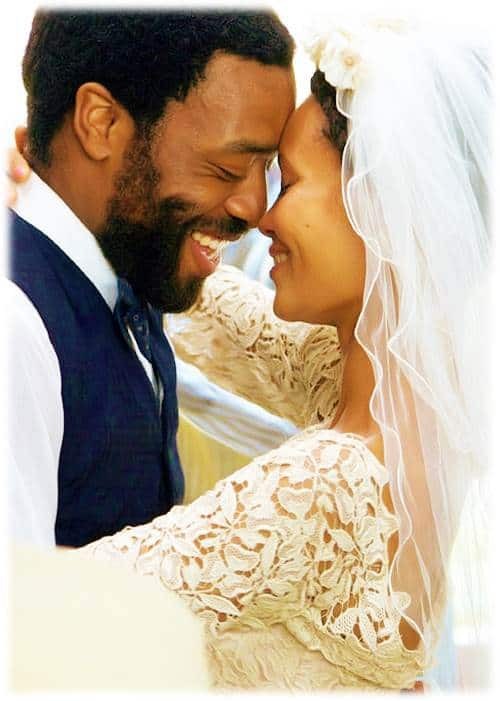 Firstly, Half of a Yellow Sun is set in 60s Nigeria, spanning the decade from independence day right through the end of the Nigerian Civil War, and it centres on the love story between a socialite, played by Thandie Newton, and her academic revolutionary lover, played by Oscar bound Chiwetel Ejiofor. This film features a strong cast and excellent production heritage (i.e. The Last King of Scotland). Secondly, this is a film adaptation of the eponymous, best-selling book by Chimamanda Adichie, which offers a multi-faceted look at the events leading up to and through the civil war, from the perspective of several characters on the losing Biafran side. The book describes painfully realistic scenarios, as well as uplifting romantic moments, all woven into the ethno-political identity crisis of a newly independent nation. However, this film adaptation wisely stays very close to the characters and story of Olanna (Newton) and Odenigbo (Ejiofor), with less attention paid to the equally important characters of Odenigbo’s house boy, Ugwu (Boyega), and Olanna’s twin sister, Kainene (Noni-Rose) and her English lover, Richard (Mawle). The movie starts on the eve of Nigeria’s Independence Day, and follows Olanna as she defies parental expectations by choosing to live and work close by her radical academic lover in the university town of Nsukka. A confident and independent woman, Olanna is nevertheless rocked to her core when she encounters Odenigbo’s formidable Mom (Onwenu), an illiterate mother-in-law from hell, who tries and almost succeeds in breaking up Olanna’s bond and with Odenigbo. The latter, for all his armchair revolutionary rhetoric, is exposed to be something of a fragile and egoistic Mommy’s boy when he succumbs to drunken temptation and has his way with her maid. Olanna’s revenge fling with Richard, (her sister’s author boyfriend), is in direct retaliation to Odenigbo’s betrayal and subsequent news that the maid is pregnant with his child, whilst she is unable to conceive. The scars hardly have time to heal when national events take a turn for the worse and Southerners declare independence from Nigeria, after a near genocidal wave of violence forces them to flee their homes in the North of the country. 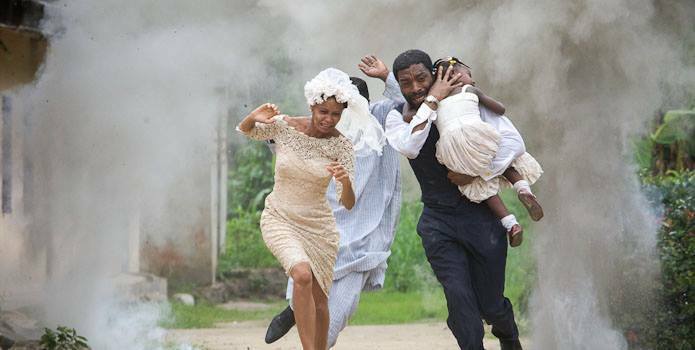 Up to this point, the film focused mainly on the couple’s love life and trials, but it now takes a sharp turn to the dark side, with the brutal shooting of Igbo civilians by the military, in front of a horrified Richard. The war is brought into sharp relief when Olanna and Odenigbo have to evacuate their home in Nsukka, complete with Ugwu and Odenigbo’s baby girl. The rest of the film is set during the war, complete with starving refugees and newsreel clips from the era, including eloquent speeches by Oxford educated Ojukwu (Biafra’s Leader) exhorting his people to fight to the bitter end. The struggle doesn’t stop the couple from getting married in Odenigbo’s home town, but not even the wedding reception is spared the shock of war when a bombing raid disrupts the celebration. I must say that the film direction, editing and score, (especially during the more dramatic scenes of war, deprivation and suffering), was very well executed, and perhaps it didn’t hurt having a much emaciated Thandie Newton acting her socks off. Apparently she suffered a bout of Typhoid fever during the 5 month shoot, on location in Southern Nigeria! In my opinion, this film deserves an Oscar nod (winning best international feature may be a stretch) for the excellent work by both cast and crew. It certainly set a high bar, pointing the way to an exciting future, for the burgeoning Nigerian film industry. Are we really meant to care?